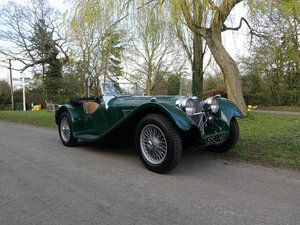 Vintage and Prestige are proud to offer this 1938 Jaguar SS100 3.5 litre by Leonida & Co For Sale. King Carol II of Romania was the first owner of the fifth 3 ½ litre SS Jaguar Saloon made, a couple of months earlier his son Prince Michael had taken delivery of the very first 3 ½ litre SS100 made to mark his 16thbirthday, as was custom for the Royals at the time. 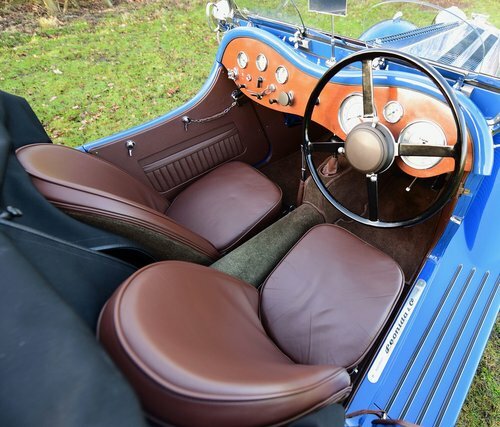 In May 1938 another car, a complete SS100 chassis with electrics and instruments but with no body was shipped to Romania by Anglo Cars and it had been assumed by Andrew Whyte that this was a ‘spare’ chassis for Prince Michael’s car. 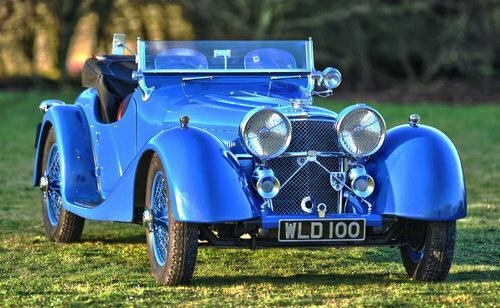 Chassis number 39070 was purchased from Jaguar by King Carol’s mother, the Queen Mother who had purchased it for her second son Prince Nicholas. 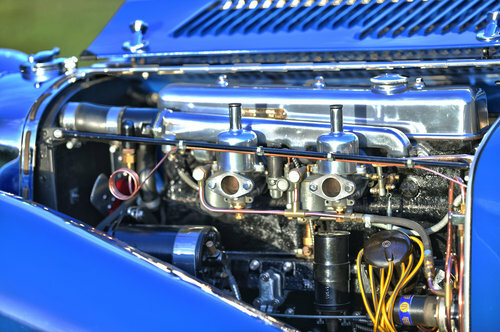 Prince Nicholas’ mechanic Jean Calcianu designed an aluminum body for the car and the coachbuilder Leonida & Co, whose premises were very close to the royal palace built the car and finished it in the same blue that she wears today. The political climate was running against the monarchy and the Prince then gave the car to his Air Force flying instructor Captain Cula, who hid it, awaiting better times. Unfortunately, Captain Cula died in an aviation accident and his wife inherited the estate. Cula’s wife was later romantically involved with her solicitor and also owed him some money. He had therefore taken the car away along with it’s papers. An influential and wealthy Bucharest dealer who had heard of the car and it’s important history from Calcianu, approached his wife to see if she would sell him the car and was told of her relationship and debt to her solicitor. The dealer contacted Nicholas Mazilu, an engineer and motoring enthusiast to whom he owed a favour and arranged to meet the solicitor along with Mazilu and a member of the Security Services, the Securitat. The intent was to scare the solicitor into selling the car and parting with the papers, so as to recover his debt from the wife. The car was identified by the Securitat man as having belonged to the Royal Family, an obvious problem for the solicitor, so a sale price to Mazilu was agreed. Nicholas Mazilu was able to pick up the car and drive it away, but en route was stopped by a policeman as the car was too noisy and was being driven too fast. Nicholas used the car and even proposed to his future wife in it, but she insisted that he sell the car as it was too beautiful and attracted too many ladies from Brasov University, where he worked as an engineer. In January 1955 Nicholas sold the car to Dr Viorel Pop who lived in Hunedoara, Nicholas told him that he must be careful in driving the car due to it’s speed. 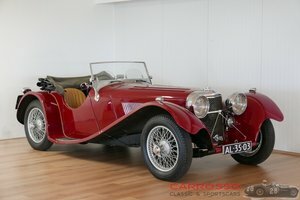 This is what is known at present of the early history of the car other that Philip Scott offered the SS100 for sale in 2000 after purchasing it from a dealer in Hungary, the dealer’s name was never released, probably to protect himself from any questions from the Hungarian and Romanian authorities, about how the car came into Hungary and in his possession. 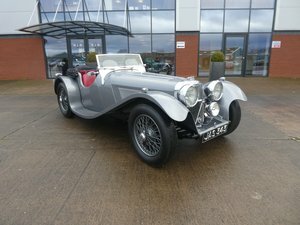 The car was then sold at Coys auction and by this time was in need of restoration, the current owner purchased WLD 100 later in the year after initially being put off by the work ahead. Since then a painstaking and meticulous restoration was undertaken with incredible attention to detail. The current owner made several visits to Romania to talk to people and track the cars history, he has even had correspondence with the now King Michael to make sure every detail was correct. This 1 off car is certainly not shaped to the usual SS100 style, from the front the wings are completely different to the standard model and at the rear the spare wheel is set into the bootlid, reminiscent of the prototype SS90 that Jaguar made in 1935. Every inch of this car has been fettled to the highest of quality and the result is truly amazing, with a smooth and powerful 3.5 litre to pull you along effortlessly. 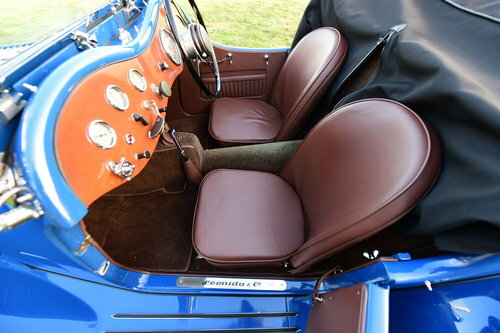 The paint and interior are both to the highest of standards, the restoration was completed in 2011 and only 1,400 miles have been covered since then. Also included with the car are folders full of history (too much to photograph) many happy hours could simply be spent going through these and learing every detailed aspect of this unique cars history. Inluded in the files are, bills, detailed phototgraphs of every aspect of restoration, history sourcing and even correspondence with King Michael himself. 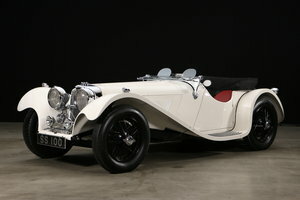 A beautiful and historical car that would not look out of place at any of the worlds most prestigious concours events. In our showroom and ready for viewing.